In a previous article, I talked about the golden rule of Mailchimp list management and the importance of trying to keep only one list in your Mailchimp accounts, however for some organisations this isn’t so easy and there may be a couple of reasons for having more than one list. The downside of this is that subscribers can possible end up on both lists, creating duplicate records, and if they unsubscribe from one list, they don’t get automatically unsubscribed from the other. This can end you up in hot water, and result in unnecessary spam complaints, which you really want to avoid! If all goes well (!) 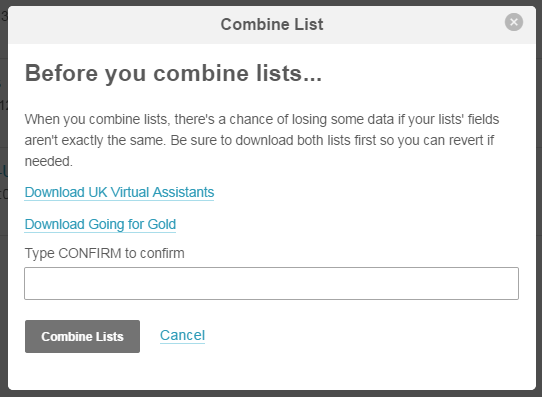 you will see a confirmation message at the top of th page telling you that your lists have been successfully combined. You cannot process bulk actions on lists that had any recent activity so if you have recently sent a campaign or autoresponder email to any subscribers on your list then bulk actions such as bulk delete, unsubscribe and combine functions will be disabled for 7 days. After this time, you are free to use these functions, provided there has been no activity since. Before you combine your lists, remember that the action can’t be undone so it’s wise to back up your list before merging them! Do this by clicking into the list you will be combining, go to settings > export and export your list of subscribers as a CSV file.